The perfect blend of sweet and savory, these unique English muffins are popping with flavor. 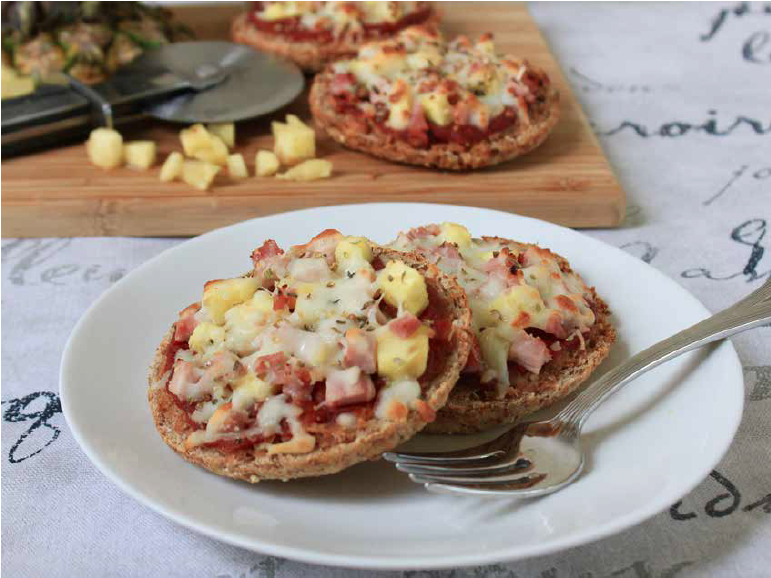 Resembling mini pizzas, they’re a tasty twist on the conventional Hawaiian pizza and are simply scrumptious! These are perfect for those times when you want to eat light, and they are very quick and easy to make. If you make a batch of sourdough English muffins beforehand, all you have to do is cut them in half, top them, and heat. Be sure to serve them warm for best results. Topped with a delicious combination of pizza sauce, crushed pineapple, and turkey ham, and covered with a pearly, smooth layer of mozzarella, these Hawaiian English muffins are definitely worth trying! Split English muffins in half. Spread with pizza sauce, sprinkle with salt, pepper, and oregano and top with meat and pineapple. Add cheese and bake at 400 degrees for 10 to 20 minutes. *Weight Loss Note: A small amount of pineapple is okay occasionally, but since they’re high in natural sugars, don’t overdo them.